In early December, I was in Columbia, South Carolina for another wonderful show by the band Jet. I was talking to their bass player Mark Wilson, and he wouldn't shut up about their opening act, Mando Diao, from Sweden. The guys in Jet are always routing for the underdog, so I was a bit wary. You could see they guys in Mando Diao nervously walking around the club, but not a soul knew who they were. Well, that changed about an hour later as they were walking off the stage. They won the crowd over that night. If you closed your eyes at the right moment, you were easily transported to some club in Birmingham, England in the mid-60s watching Eric Burdon lead the Animals through a sweaty set in some workingman's club. 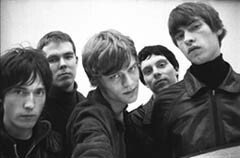 Mando Diao is made up of 5 young men from Sweden who are too energetic to be contained by their home country. Every country they have played in has applauded the bands energetic live show. They are currently suffering from the enviable problem of being stretched thin when it comes to promoting their cd Bring'em In. Going on two years ago, the cd was released in Sweden. They were so well known for their live show that they were invited to play a festival in Japan. This led to a period of Mando Diao mania in Tokyo. After having dolls made in their likenesses, they finally made it over to the United States. Great press has followed, but now there are complaints about there not being new material released in the locales they conquered first. This is a problem most bands would kill for, but it is somewhat exasperating for five young men from Sweden. BRING 'EM IN, Mando Diao's new CD on Mute Records is a great collection of songs that truly represent the energy that the band displays on stage. Bjorn Dixgard and Gustaf Noren share the vocal duties, and both are capable of fronting a band on their own. While Gustaf is known for his manic stage behavior and vocal delivery, Bjorn can bring a wild crowd to a screeching halt with his soulful vocals on "Mr. Moon". Another thing to praise this band about is its dynamic rhythm section. Samuel Giers on drums and CJ Fogelklou on bass are not your wallflower type of rhythm section. These guys light a fire under everyone else. Instead of everyone in the audience watching the person anointed as the face for the band, watching Mando Diao is more akin to watching a meteor shower with bodies flying in all directions and sweat and screams flying from the drum kit. I had the pleasure of talking to drummer Samuel Giers before Mando Diao opened for Jet at the Cotton Club in Atlanta. From reading previous interviews, I was not sure what I was going to encounter. Quotes from previous interviews made the guys in the band sound somewhat pompous, but from my first moment meeting the band, I knew then that what I had read had only been youthful exuberance. Here were five guys away from home who only wanted the chance to get on stage and show the audience what Mando Diao was all about. Watching Samuel Giers playing drums makes you wary of having to deal with him in person. Behind the kit, this man is possessed, while off stage, he is one of the nicest guys you could possibly have the pleasure of talking to. As we went to the bar to have a chat, I could tell that he was somewhat nervous about being put in this position. Although he is comfortable conversing in English, you could tell that he wanted to make sure that I understood what he had to say about Mando Diao and his career as a musician. Here is a bit of the conversation that we had that evening. EC: What inspired Mando Diao to have the 60s garage-soul sound that it does? Samuel Giers: We get our sound from the records that our parents played as we were growing up. We listened to Nirvana and Guns n Roses like everyone else, but it was our parent's records from the 60s and the Motown records that really affected us. EC:As a drummer, who has influenced you? Samuel Giers: Ringo, Mitch Mitchell, Keith Moon. Over-the-top drummers. EC: With you being such an explosive drummer, is it difficult for you to tone your playing down for ballads like "Mr. Moon"? Samuel Giers: No. I enjoy songs like that as well. We also enjoy playing acoustic. A good song is a good song. EC: Obviously you were somewhat shaped by what you saw on MTV Europe as a teenager. Samuel Giers: Not really. We come from a small town. We did not get MTV until much later. EC:Were there any bands from Sweden that influenced you? Samuel Giers: I like The Hellacopters, but I am really not into the Swedish scene. Many of the bands in Sweden are too conservative. EC:How did you get from the small town of Borlange to the festival stages of Japan? Samuel Giers: Luckily, someone saw us play and we were invited to play the festivals. No one really knew about us, but after we played, everyone wanted to get to know us. We are having a problem now where people in the places where we first played are wanting new music, but we are still promoting the cd in the US. In the fall, we will be releasing our 2nd cd. We already have 35 songs. Our rule is to keep it simple. EC:When working on these new songs, do the members of the band ever argue over the direction of the song as it develops? Samuel Giers: No. We all come from the same musical background, so we pretty much agree on things. EC:Compared to what you thought, how has been touring outside of Sweden been for you? Were you worried? Samuel Giers: It has been good surprises so far. We had heard stories, but it is very good. Some of the shows have been small, but we have always been able to get the people excited by the music. EC:What have been your favorite cities so far? Samuel Giers: I like the feel of LA, San Francisco, and New York. Birmingham was fun. Mando Diao is currently in Sweden working on their second CD, but they will be back playing shows in the US this Spring. Catch them if you can. It is wonderful to see a band that is not affected by the trends set forth by the imagemakers at MTV.